The Race Tracker is simply a web page that your regatta viewers load in any modern web browser. 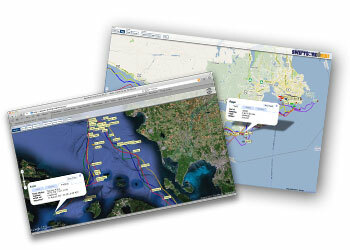 The software allows a user to easily locate yachts, get information on the yacht and follow its movement around the race course. The viewer seamlessly updates behind-the-scene, allowing the user to always stay up-to-date with the race. The Race Tracker is based on Google Maps and entirely styled with dynamic CSS allowing complete control of the appearance of the tracker to give an integrated look with your regatta's website.